The ATI-110-N tankless water heater uses up to 140,000 BTUs of natural gas to deliver a max flow rate of 6.6 GPM. It utilizes non-condensing technology to achieve an Energy Factor of 0.82. This model meets Low NOx emission requirements, and comes with a 15-year limited warranty. 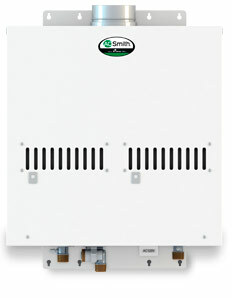 The comprehensive line of A. O. Smith tankless water heaters provide hot water on-demand. When a hot water tap is opened, a flow sensor sends an activation signal to the onboard computer. The computer then activates the combustion system. Heat is transferred to the water as it flows through the heat exchanger and an outgoing water temperature sensor keeps water temperature to within +/- 1F of set point. Once the hot water tap is closed, the heater automatically turns off. The primary heat exchanger is constructed of commercial-grade HRS35 copper, which is stronger than standard copper and more resilient against erosion. Condensing models feature 316L stainless steel secondary heat exchanger, providing additional protection against corrosion.